We’re picking up good vibrations (good, good, good, good vibrations, oooh bop bop, good vibrations) in Answer Me This! Episode 219, thanks to one of our listeners sending us a Groupon offer for Power Plate sessions. Plus: Olly believes china shops should tolerate, nay welcome, his unapologetic vandalism; fun-hating Helen eschews murder mystery parties, entertainment at weddings, and jiggling in public; and Martin the Sound Man is still imploring you to enter his competition to be the Science Songwriter of the Future, which sounds a bit like being the artist-in-residence on the International Space Station, but is in fact much more straightforward and does not require you to urinate into a funnel. Although, the prize includes a trip to the Green Man festival, so a funnel might prove more hygienic than a Portaloo. 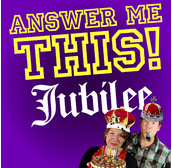 This week’s Bit of Crap on the App (available for iDevices or Android) recounts some incredible facts about jubilees, such as how they used to lead to famine, and how the Queen was probably wasted on hers. This seems a suitable point to mention that the Answer Me This! Jubilee is at last available to buy on Amazon. You may think it a bit late for Jubilee Fever now, but we’ve got a £50 bet on the Queen reaching her Platinum Jubilee, so consider the album 15 years ahead of its time rather than two weeks behind. 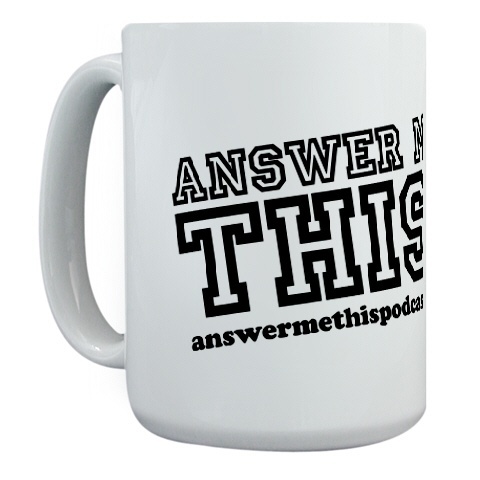 If you want more AMT next week, send us a QUESTION: emails should be sent to answermethispodcast@googlemail.com and voicemails left on the Question Line (dial 0208 123 5877 or Skype answermethis). Plus: Olly harks back to when he won an election – he claims democratically, but then so did Putin; one day, Helen dreamed a dream of becoming Brian Turner, but never did it come to pass; and after twelve and a half years in the dark, Martin the Sound Man finally hears the sad news that the Two Fat Ladies will not be returning to his television screen. This week’s Bit of Crap on the App (available for iDevices or Android) concerns the only thing we don’t like about Mexican restaurants: the unwelcome phenomenon we like to call ‘Guac Tax’. 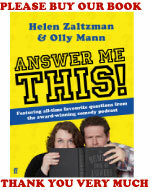 Well, that’s the new series begun, but please help us make it an absolute corker by sending us your exquisitely finely-honed QUESTIONS, as emails to answermethispodcast@googlemail.com and voicemails on the Question Line (dial 0208 123 5877, Skype answermethis). Also, if you want to be moved to tears of derision like John, the final caller in the episode, scroll down to the bottom of this post to see the pictures of our parents (oh alright, Olly’s lovely mum). Plus: Olly’s love of aubergines knows only two boundaries; Helen really wants to know what is happening behind the smooth visages of human statues; and Martin the Sound Man reminisces about his days as a junior lothario, sadly before such times as he was actually interested in the ladies. Thus we learn the importance of not peaking too early. This week’s Bonus Bit of Crap on the App is Olly voicing his OUTRAGE at Pret A Manger for withdrawing the only thing that made him want to return to Britain from Ibiza. 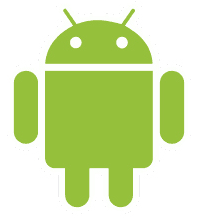 We hope that the Pret Powers That Be have our app on their iPhones, iPads and Android devices, so that others might be saved from suffering as Olly has. Cheer him up by sending us your QUESTIONS to fuel the new series: ask them in voicemails on the Question Line (dial 0208 123 5877 or Skype answermethis) or emails to answermethispodcast@googlemail.com. Together we will make AMT happen, oh yes we will. What would you do if you had the run of the Houses of Parliament? Rifle through all the documents with TOP SECRET stamped on them? Leave a drawing pin on the Speaker’s chair? Try on all of Theresa May’s shoes? Or use their wifi to listen to Answer Me This! Episode 177? Plus: Olly would have got more action at university had it not been for his inner gameshow; Helen gives a lesson on basic squid anatomy; and Martin the Sound Man swears that with bog-standard telescopes, you could read a copy of yesterday’s Evening Standard that someone had left on Uranus as clearly as gawking at it over the shoulder of your fellow commuter. This week’s Bonus Bit of Crap on the App (available on iPhone or Android) sees Olly point the finger at the real villains of the 21st century: anyone who puts one of these in their mouth. You monsters! 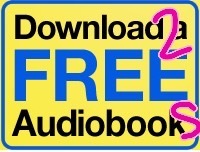 You have until June 5th to snap up free audiobooks and half-price Audible membership at answermethispodcast.com/audible, but you have all the time you need to ask us QUESTIONS, in the form of voicemails on the Question Line (dial 0208 123 5877 or find answermethis on Skype) or emails to answermethispodcast@googlemail.com. 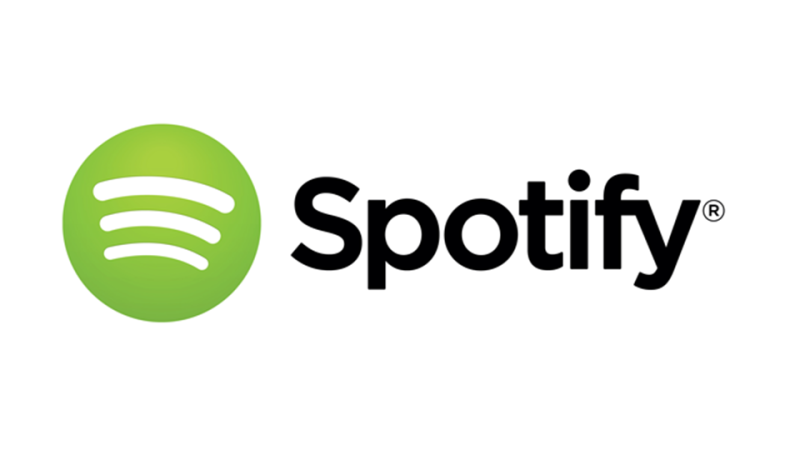 Although don’t take too long over it, because we’ve got to be back here next week with a new episode, and without your questions in it, it’d be like we’d turned time back to Web 1.0. Which is just too awful to contemplate. Plus: Olly finds the present day to be lagging behind in meeting targets set in The Terminator; Helen reveals the secret that made Neil Armstrong the first man on the moon; and Martin the Sound Man is quite quiet and well-behaved because he’s really thinking about getting back to playing Red Dead Redemption. A podcast cannot come between the man and his PS3. Harrumph. We’re looking to you to keep our spirits up in these tryingly footbally times, so please send us QUESTIONS with which to distract ourselves, in the form of a voice message on 0208 123 5877 or Skype ID answermethis or an email to answermethispodcast@googlemail.com. Ta for that.